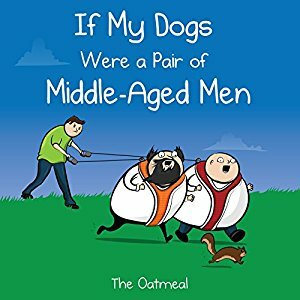 The book is the story of the author’s two dogs pictured as two middle age men. It doesn’t sound funny but it is totally hilarious! I’m sure the people at work were wondering why I was first giggling and then laughing out loud at some of the cartoons. As a servant of two cats, I enjoyed The Oatmeal’s earlier book, How to Tell if Your Cat is Plotting to Kill You. However, as an owner of two dogs, I loved this one even more. Who hasn’t wondered why dogs circle “thrice” before doing their business? Or why dogs chase cars but run from toddlers? After reading this book, it feels weirdly normal now to see dogs portrayed by middle-age men. I’m going to picture my two-year-old female Chihuahua, Janet, as a middle-aged woman from now on. Hopefully, that will explain some of her inexplicable behavior. This book will be published on September 27, 2017. I received this book from net galley in exchange for an honest review.